Think about it. Will you? 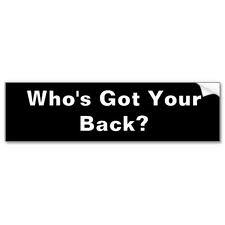 You got my back and I got yours! Individuals, Teams & Organizations the world over seem to have taken this adage to heart as they strike deals and alliances, a few in writing, more in word & much more as an untold principle while they work feverishly to be successful. In order to embrace this principle, you do not necessarily have to be on the same side; rivals are known to have leveraged this undercurrent as well. Glance at the world of business and politics around you. You will find examples galore. It is just that those who are outside such an alliance are not too pleased. Well, if you are the one left out of a party, how would you feel? In every realm of society, be it corporate, social or political, forming such alliances and moving forward has become a norm. I don’t have anything against them. In order to progress and make better, it is important to have, know and work toward these unpublished agendas. But, on the contrary, as we have often seen, these alliances can be exploited to get more than a fairly deserved share. But, that’s another discussion for a different day. Today, let’s look at the positivity of these totally present, some visible but mostly invisible relationships. Together, as a team, one can grow and help others in the team grow as well. There are so many corporate examples of executives & their teams built over years of working together, and the end result, all of them growing together. You can see that kind of symbiotic relationship in government as well. Further, there are several family businesses that have grown and flourished so long as the family remained united and stood together. Once they break up and try growing their individual shares, they have discovered how difficult and slow a process it can be. Besides, the vultures waiting to nibble away at their pie take flight and there are none but just them guarding their pie. There is an interesting observation that comes to mind. Frogs in a well; when one of them tries to climb up, the others pull the one down by moving from beneath him. In the case of ants, in order to reach up to anything, they form a chain and help each other by walking over other ants. That’s the spirit of winning as a team first, and then as individuals of the team. As an old saying goes, “Unity is Strength”. As an individual, there is only so much you can do to influence your own progress. Find people who can complement your skills, find true partners and well-wishers in your friends, peers and mentors and form your team. Work together, work with and work through them to reach your goals and at the same time help them reach theirs. It could be an active partnership or one of those in principle, where you have their back and they have yours. Together, you form a formidable team and will succeed beyond your wildest imagination.